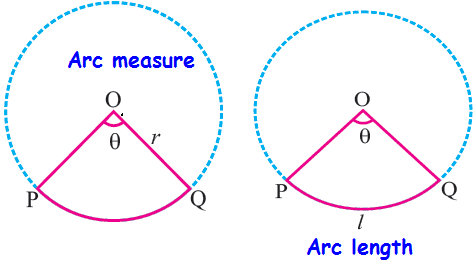 About "Arc measure and arc length"
An arc measure is the measure of an angle that the arc creates in the center of a circle. This measure can be given in degrees. Arc length of a sector POQ is the length of the portion on the circumference of the circle intercepted between the bounding radii (OP and OQ) and is denoted by l.
The arc length of a sector is 66 cm and the central angle is 30°. Find its radius. The length of arc of a sector is 22 cm and its radius is 10.5 cm. Find its central angle. Hence the required central angle is 120°. A pendulum swings through an angle of 30° and describes an arc length of 11 cm. Find the length of the pendulum. After having gone through the stuff given above, we hope that the students would have understood "Arc measure and arc length".